Good to know, Michael, that Canada is similar to Australia in this respect. I had a friend who contracted cancer about 20 years ago. We were both in the north of Australia at the time of the diagnosis, and she was immediately flown to a specialised hospital in the south of Australia where she had a major operation without delay, followed by a series of radiotherapy sessions, all covered by the national health system. She had no private health cover and there were no additional expenses apart from the normal expenses of accommodation in a different city. She's still alive and kicking, 22 years later. Re: May we ask how Mike is doing? On a recent trip to Vancouver Island (BC), my wife and I got talking with our B&B hosts about moving to Canada (we live in Massachusetts, where we have better health care than in some other parts of the U.S.), but I understand that Canada doesn't really want U.S. retirees flocking to their country for the sensible health-care system. So all we can do is try to educate everyone we know down here about single-payer and hope that the U.S. will some day join the ranks of civilized nations, like Canada, Australia, and -- heck -- al the other advanced nations of the world. I'm glad you're in Canada, Michael! Thanks for everyone's thoughts and concerns. I'll be finished chemo in less than a month. It's taking a toll on my strength, but I know that by late November I'll be able to start regaining it. I've received a number of emails from the US asking if I have sufficient medical insurance. The answer is that in Canada we have a single payer system ( as it's called in the US). Health care for everyone is the same as education though high school, which no one has argued about for about 100 years. It's simply paid for out off our taxes. I've had countless CT scans, Bone Scans and MRIs. I've had two major surgeries, one of them at least some 8 hours followed by 13 days of hospitalization, and now some months of regular chemo. Oh, yes, regular home visiting nurses when I was first home from hospital, all drugs included, 24 hour hotline to specialist nurses if there were questions. My total cost? Zero. Pre-existing condition exemption? Not in our vocabulary. Co-pay? Not in our vocabulary. Universal health care, for every resident of the country, available freely to all. Just as in most advanced industrialized countries around the world for the past 50 years plus. Why am I preaching here. Because for the first time my life was in the hands of the system, and I do mean "life". Delays? I went from detection of a T3 bladder cancer with node involvement to surgery in less than 10 days. Change Doctors? Any time one likes, and I've done it before. Does the Canadian system work? Yes. Is it perfect. No? Nothing ever is. But contrary to the misinformation that we hear daily on US TV it works well enough, and none of us would trade it for what we see across the border. If some see this as a political encroachment on an inappropriate forum, so be it. But if you're considering the slow development of modern health care administration in the US as the topic comes up, talk to friends across the border to see what their first-hand experiences have been. Some will undoubtedly not be a simple as mine, but I'll bet that not a one of them would trade it for what exists currently in the US at the moment, even including Obamacare. Obamacare is simply a band-aid on a sick system that needs major surgery. Great to see you posting here and especially great to hear the good report. I agree about the US health system being a very sick system. I am an American that has been living in Germany for almost 3 years and have been LOVING the health system here. It is amazing how well it works. It really shines the spotlight on the faults in the American system. Great to hear that our system is looking after you so well Michael. first of all - great to hear from you that you are on the right way to your recovery !!!!!!!!!! Please, take care of yourself ! Michael, Glad to hear about your progress. All our fingers (and toes) are crossed for a perfect recovery. We miss you and hope that you can turn your focus towards more enjoyable things again soon. Courteous Explorer | Photographer | Dog Lover - Passionate about nature, people, technology and design. Great to here you are doing well. Sounds like the Canadian health system is similar to the NZ system. I'm another Canuck--by choice, for I was born in British Guiana--and did prostate cancer and a triple by-pass in 2005. Now my cancer was not nearly as serious or aggressive as Mike's, but here is my sequence of events. Late September, in an annual physical, my GP says he can feel nodes on my prostate. OK, get a PSA test; it's up. So, early in October it's off to the guy with the expert finger who says, Oh yes, you've got nodes there, fella, so I'm sending you for a needle biopsy. Late October the report on the eight-needle biopsy is in: six of the eight samples show cancer cells. By early November I'm having a thorough examination from my oncologist at the BC Cancer Clinic (with a world class rep on prostate, and no doubt, other cancers). After discussion, I opt for radiation treatment using directed and collimated beams, which means getting the location of the prostate fixed and aiming tattoo spots placed on the pelvic region. That's all done by the end of November and the oncologist is all set to start the hormone treatment to shrink the cancer; I'm in the midst of a major consulting gig and the cancer is not judged to be aggressive, so I say let's start in mid-December. In mid-December I go up to the Cancer Clinic's pharmacy to pick up the hormone injection. I'm not sure if my medical insurance will cover this, so I offer my credit card to the pharmacist's assistant. She says, No I don't need that, sir, but please don't misplace this before you get it to the nurse at your family clinic, because it's worth about a thousand bucks. I promise not to misplace it and the subcutaneous injection is performed just before Christmas. By the end of February, I'm feeling a bit beat up, but an ready for radiation to start. Thrity-seven treatments later, about four minutes a day in "the room" for five-days a week, weekends off for good behaviour which is when I return home to get my bearings, that's over. PSA is down to zilch, and now seven years later it's 0.4 and the experts are pleased. Later that year, it's a triple bypass within five days of my complaining of chest pains. Helicoptered from where I live to one of the heart-specialising Vancouver hospitals. four days later, I'm out. What was my total bill? Forty bucks for one ride in an ambulance (not the helicopter)--no charge for anything else. It works for me, I want y'all friends down south of the border to know, for my pockets aren't deep enough to pay even a small portion of the real costs. I'm glad you're doing so well and have had such positive experiences. I've been in the hands of my countries health care system more than once. Many times in fact. And while it's impossible to rate medical conditions as the same as, or worse, or better than others.. I would say mine is up there with yours but chronic by nature. Something I didn't notice at first, is a type of loyalty and even debt we start to feel for those who cared for us. Yet it's common, cancer survivors start foundations, survivors build hospital wings, some like me go back and work for the system for a few years. There's nothing wrong with any of this, it's a human condition. Understanding these things if we already didn't brings perspective we might not have had. So when I hear you praise your medical system I'm happy for you, and for Canadians in general as I've heard a lot of first hand negative accounts as well. As an expat living overseas we tend to have more access/insight into citizens of other countries and we hear more examples than if not an expat. But before we go comparing countries, especially where medical expenses are concerned, to be fair and credible we must understand several precepts. 1. Nothing is free. Someone is paying for the healthcare you received. Someone will always need to pay for the healthcare you require in the future. 2. Most countries pay for their healthcare systems via taxes. 3. The higher the ratio of those paying taxes vs. those not.. greatly determines the budget for things such as helathcare. These precepts come home to roost when you realize most advanced industrialized countries enjoying "Universal Healthcare" can no longer afford it, not as easily as before, and not to the same level of service as before. They have cut back services, increased waiting times for services, hired foreign doctors in huge numbers, and have been trying like hell to keep their universal systems viable in our modern economies. I hear even Cuba has a Universal health care system, Castro touts enough, but is it a system I'd seek care for my family in? As our economies modernize, demographics change, and healthcare practices evolve.. All of this will change. And how ironic would it be for the worlds richest country to have adopted and now enjoy a system most advanced industrialized countries were forced to give up as times changes? I suspect we're going to have such issues with much more than healthcare. I would just like to point to the fact that the US spends a larger part of GDP on health care than any leading industrialized nation. The enclosed figure is old but still valid. Leading European countries are still in the 9-11% bracket while the US is now around 17%, those figures being prior to 'Obamacare'. It is perfectly possible the US citizens get more bang for the buck, I don't know. Here in Sweden we do have issues with health care, I cannot compare with other countries and have little own experience, thanks God, as I used to be healthy. I think it's a mistake to only look at one or two numbers. Or to respond with only one or two numbers. Healthcare is extremely complex and there's not a country out there who doesn't need a lot of work done to optimize their their care. I think reasonable people agree on at least that much. If we are truly to look at who's getting the most bang for the buck I'm convinced it's the countries who are reaping the benefits of other countries medical research, pharmaceutical industries, and training facilities.. but not paying for them. Even so, their care might be cheap but it might not be the best. We could compare the military services between countries in the area of cost vs. tasking and get like answers. When the US spends in such an area, it benefits more than themselves and most often allows others to spend less on their own military. This tends to be taken advantage of. Tell me when the last NATO country actually met their NATO obligations? It's been decades. Looking at numbers like "Cuba has a higher life expectancy than.." is all well and good until you or a family member gets a serious disease at age 40 and your country isn't equipped to deal with it because they haven't the equipment, drugs, or training to do so. If you're only concerned with who lives the longest, us or them, then go for those life expectancy numbers. Don't bother to consider genetic information, environment, culture, foods, or other such factors. Or what happens when you're one of the millions who die each year from other than natural causes. Having lived in other countries (many) for almost all of my adult life what I personally look for in health care systems? Are there facilities, training, dugs, and personnel available to treat me and my family if we get sick or injured. And can we get them to treatment. An example would be Thailand, high on the medical tourism list of places to go for face lifts through heart transplants. I've been a patient at Bumrumgrad Hospital (a private hospital for the rich/royalty for over 12 years and received wonderful care from their US trained doctors, US equipped facilities, and US stocked pharmacies. They are inspected every two years by JCHAO just like any western hospital of merit. They even have nice places to eat and shop. Showcase quality and they know and charge for it. Yet the country has no real emergency services. If you are in an accident almost anywhere (or have an event at home), even Bangkok, there is no life flight, no paramedics, and the drivers won't even yield to oncoming lights and sirens. If you are in a major motor vehicle accident in Thailand you can consider yourself lucky to be crammed in a short bed small pickup truck with a camper shell (too bad if it's a 5 foot bed and you're taller) and transported to the nearest hospital who will take you. If you're not Thai with a known insurance card, or have your own accepted insurance card you won't be admitted. Laws allow this. You go down the list from private hospitals, to police and military hospitals, university hospitals, to public hospitals. Huge differences between each one. Your watch, wallet, etc.. would be lifted for services rendered by the emergency truck mafia. I'm not making any of this up.. Yes, they have their showcase paramedic and fire personnel and some well trained military people. But they're kept largely in reserve for the privileged and royalty and wouldn't even consider deploying their vehicles for a private citizen or a foreigner unless it was a huge event like a terrorist bombing, etc.. they knew would be covered internationally. I look at medical care like I do politicians. We tend to get that which we deserve. Having been back in the states about 18 months now I must say I'm pretty impressed with our healthcare system. And this is in the poorer midwest. We are treated in the same facilities right alongside the same people who don't have insurance or other means of payment. Since we've been back members of our family have been treated for various aliments ranging from cancer to dental emergencies. We've had great service everywhere. My "co-pay" is $12.. scripts are $2 each. I think we'll make it. Why such good rates? Because I made choices and sacrifices decades ago specifically for these reasons. Because the mindset in this country has always been we're self-reliant, we plan and save and look after ourselves. What's left over goes to charities or causes we believe in. And when we can't, we know we'll still be treated but perhaps we won't be given extras. In contrast other countries look to their governments to provide such things which I mentioned is what they deserve. And most are so totally disconnected from who actually pay the bills that they still say "it's for free.." Is it? Just curious -- Is that because an employer is picking-up the rest of the health insurance premium? Do you mean those people receive free preventative care or do you mean the unpaid emergency room costs are picked-up by tax payers? "62.1 percent of the bankruptcies were medically related because the individuals either had more than $5,000 (or 10 percent of their pretax income) in medical bills, mortgaged their home to pay for medical bills, or lost significant income due to an illness. On average, medically bankrupt families had $17,943 in out-of-pocket expenses, including $26,971 for those who lacked insurance and $17,749 who had insurance at some point. Overall, three-quarters of the people with a medically-related bankruptcy had health insurance, they say." 1. 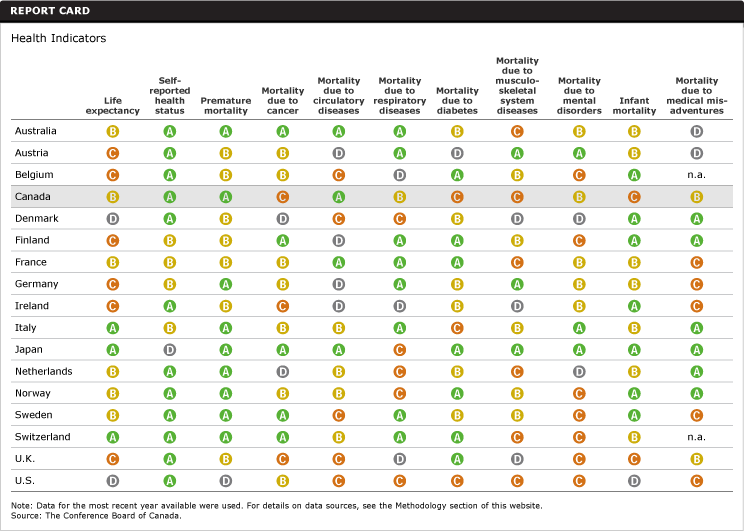 Why would a graded by Canadains, in Canada graded health survey, be of interest to anyone but a Canadian? What I've been trying to say isn't being understood. Allow me an additional opportunity? A countries health care system is complex. There are many contributing variables and factors. Comparing countries with unlike variables and factors is of marginal if any use. There are too many significant differences between the US and Canadian systems for them to be compared to on the whole. Trying to do so is folly. Personally I don't think there is another country to be compared with the US on the whole. There are single factors and variables we could compare, but they're quickly and instinctively explained by one or more of the other variables/factors. 2. I would be surprised if a biased article for Canada would give any better of a grade to the US.. We can all see why ? 3. I was speaking of clinics and waiting rooms which normally cater to appointments. The emergency room myth is a good example of how myths start and why. When I came back to the states after being gone a number of years one of the first things on my agenda was to shop for a clinic, doctors, etc compatible with my health insurance. Virtually every one of them had an "urgent care clinic" which falls under the same laws for those who can't pay. And they're used at least partly as a filtering point to get those without insurance or income into the best fit of a program. So to answer your question, they were part of a program, either medicare, welfare, whatever name they're giving it.. which qualifies them for this program. They all include preventative care from what I could tell. At what levels and compared to what I don't know. But it was impressive because everything needed was available (from what I could tell from my vantage point). everyone was treated well, and the clinics were very nice. I was surprised to learn they're building a newer more advanced center my current clinic will be transferred to later this year.. so there's progress there as well. 4. Of course. This is how all insurance companies work for all but the self-employed or those unable to pay. An insurance plan is offered as a benefit of employment and your contributions are detailed in your employment contract. In many cases you can choose to purchase supplements which further cover yearly deductibles and contributions for a monthly fee. Often there are several levels so you can tailor your personal requirements to a plan. It's all very friendly and easy to understand. 5. I don't wish to be rude, but in matters of such import I don't leave it to luck. I put in enough research time to understand what's going on to the best of my abilities. And then I choose the most appropriate plan which will cover me and my family. Luck intones I have no control, or at least that I needed help because I had lost control. And that would not be the case. Also, I've personally went through the scenario where someone gets hurt enough to require years of surgeries, further years of rehab, and drastic changes in employment, lifestyle, etc. I've lived it. I could write books about it. When this happened I immediately knew I'd lost my life as I knew it. My career was gone, I was certain more would be lost, it just didn't take many brain cells to see all that coming. My thoughts then went to my occupational and financial recovery. I'm proud to say at no time did I have to worry if a hospital bill was paid or anything of that nature. Or if I wasn't getting the best care possible. I was confident I was. No matter, if it wasn't I'd have just put it on the rather long list of things I'd attend to when I could. At no time did I expect outside help to pay me for the loss of my career, or any of the other things I wasn't planning on. I planned, I think well for my age at the time, and did my best with the outcome. And then I took my disabled self and built a new career. At no time did I ever expect anyone to do it for me. Or feel bad because my government didn't cover me 100%. I'm just not built with that sort of mentality. And if you take that brief paragraph you listed.. that 3/4's thing.. Read it carefully. Do just a fair amount of research. Compare it to yourself and your own set-up and choices. I'd be surprised if you didn't become at least a bit really at those willing to game the system as most of these people have done. When I see such flotsam coming from my own country I become even more discouraged with the political party responsible. The people who write such articles understand that the majority of readers won't do any research, they'll just take it as written. This is their target base. Then you have a minority who do research to some degree, and others to a higher degree. You see, most people stop when they see what they already agree with. This is who the article is written for. And if they're good at this type of targeted slop there will be another 15-25% who will research it just enough to confirm a few other parts. But it's usually under 25% who read it enough to understand what they're really doing. And these people, that 25%.. probably isn't from their party anyway. If you put out enough of these things then a number of people will start to believe it. These people, and the reinforcement of the 50%.. that's what they're really after. Both major parties do this. It's not unique to anyone. It's old and tiring and frankly insulting. It's this sort of thing that impedes real progress from any direction. And you'd be surprised how many profit greatly from no progress being made. Thank you for a polite discussion. You didn't see a need to get insulting like someone did later in the thread who tried to be cute. I really do believe the US (and most every country out there) can and should improve their system. But I think the "my country is great and gives me free stuff so your country should too" approach isn't productive for anyone. I could have cited articles which were written and support my POV, what numerous Canadian expats have shared with me, etc.. but what I really would like, and I felt you left yourself open to it, is to just politely talk about the differences and what we think should be done about them. This isn't a debate where anyone wins. Ever. But we can understand it better. Not for nothing....but this thread is intended to provide information about Mike's health...since it's Mike's site, he's entitled to sprout the occasional editorial comment about his healthcare without a full on US vs. the World debate. This thread ain't the place for it (and in fact LuLa ain't either). If you want to keep up the debate I suggest The Coffee Corner would be the place to do it. I agree, I removed all my postings. My apologies for the intrusion. Then your assumption would be wrong based on how I've responded to each question asked and to each point made. More than anyone here. All without insults or losing decorum. But it's going to take a bit more dedication to logic than the insults and combative nature you've exhibited so far and judging my your posts your not up to it.. When I see responses of the type you've made I find the respondent isn't really interested in discussion, answers, or truth. And they're far from secure in what they believe. It's actually typical. So let's leave it as that, a thread inspired by the host of the discussion forum who we're told by proxy wouldn't appreciate such discussion on his forum. Get well soon, Mike. We are all thinking of you! I was not acting as a proxy for Mike...Mike is perfectly capable of saying what he thinks if he is so inclined...personally, I would just simply like a thread where Mike (or Chris) can come and give us updates or well wishers can offer their support without a lot of off topic gyrations...hey, opinions are like assholes...everybody has one and nobody but a proctologist really likes to go there. I have a lot of thoughts about the US healthcare system...I have a daughter that is privately uninsurable (at any price) because of preexisting conditions (she has an Illinois State provided insurance that is itself pricy) and my wife and I, being sole proprietors, pay a massive premium with lots of deductions. I wish I got some coverage from being an employee but, well, I don't do so well working for a "real" boss, ya know? Everybody has their cross to bare...but knowing people here in the US as well as friends all over the world, the US system, like any system works "ok" if you have means...if not then it's the luck of the draw. Personally, I'm really glad Mike got the level of care he got in the time frame he got it...Mike & I had gotten together in mid-June (with Eric Chan) just before all the stuff happened...it was a shock how quickly all tis happenedI wish him well and hope for the best.